Ηe hostel consists of two buildings constructed with respect to the local architecture. It has 18 cozy rooms, all with bathroom, equipped kitchen, TV, central heating, air conditioning and free wireless internet. 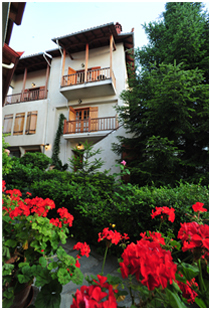 The guest house also has a private car park, a garden and a terrace overlooking Mount Olympus and the sea. The reception area includes a lounge with a fireplace that is open from 8.30 to 23.00 and a breakfast room. Breakfast is optional and is served from 8.30 to 10.30. Enjoy moments of warmth by the fireplace in the winter and coolness in the lush surroundings of the courtyard in thesummer. We place special importance on quietness, cleanliness, attention to detail and friendly service.